Itchy and Scratchy – Why is My Dog’s Skin Itching? Whenever your furry friend starts scratching, your first thought is most likely – FLEAS!! But there are many other causes of itching and scratching in dogs, and you need to be aware of them. A dog that is furiously scratching, obsessively biting, or compulsively licking himself is incredibly annoying – but imagine how distressing the whole thing must be for him? This is not an uncommon problem in dogs. While yes, fleas may be the culprit, if you are on top of your dog’s regular flea and tick treatments, it’s likely another cause is to blame. Hot Spots can develop from persistent scratching, licking and chewing at an irritated spot. It becomes moist and inflamed and is most likely to arise on the head, hips, or chest. You need to address itching and scratching before a hot spot develops. Why Do Dogs Itch and Scratch? Allergies – to food, mould, pollen, or other environmental triggers. Even soap or pesticides they encounter can cause an allergic reaction. 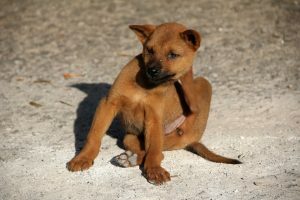 Parasites – fleas, mites and ticks will cause itching. Anxiety – dogs can suffer this as well as issues such as OCD (obsessive-compulsive disorder) just like humans can. It can manifest as unrelenting biting, chewing, scratching and licking. Hormone Imbalance – particularly too much cortisol, or not enough thyroid hormone, can cause skin infections and bald spots on the dog’s body. Pain – can cause licking and chewing. For example, a thorn stuck in his foot; pain from arthritis. Lack of proper dog grooming can also be a factor. It’s important to get to the bottom of why your dog it itching. In most cases, it’s simply an activated immune system and identifying the source of this is the key to solving the problem. Your vet is the ideal person to help identify and treat the cause of itching and compulsive scratching in your dog. Treating parasitic infestation if it is present and maintaining preventative care. Altering your dog’s diet – food allergies are common and usually caused by commercial dog foods. (Watch for general itching, weepy eyes, sore ears, red belly, and nibbling, chewing and scratching at the body). Add anti-inflammatory ingredients to your dog’s food, including vet-approved cod liver oil, Golden Turmeric Paste, and Calendula. An itching dog is the single biggest reason pet owners seek online advice regarding their pet. It’s the third most common reason for taking a dog to the vet. Identify the cause of your dog’s itching and treat it quickly – so you can both relax.